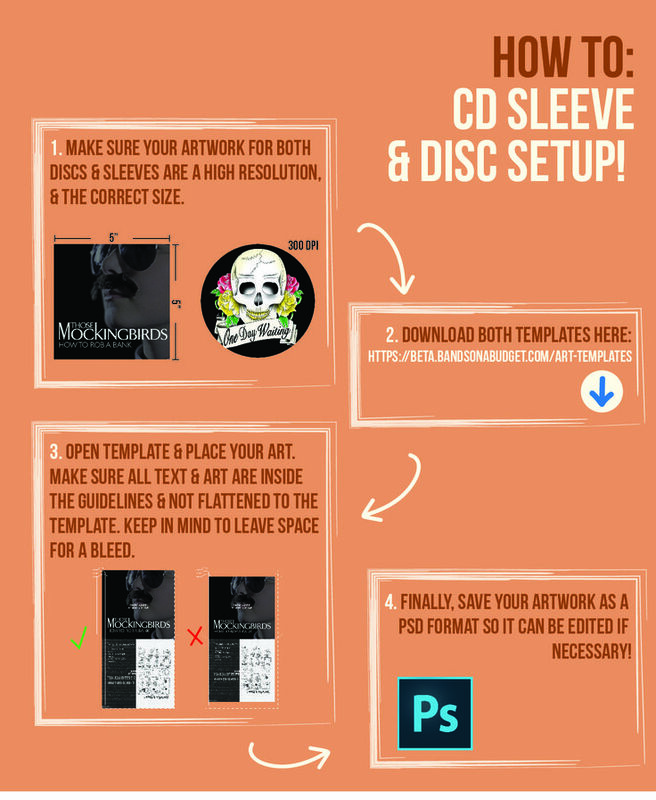 One of the biggest questions we get when our customers are looking to order custom CDs and packaging, How do I set Up My Artwork?!! Now that ordering CDs for your project has been made wayyy easy, we wanted to make sure the art set up went just as smooth. We asked Art Department Manager, Gabby Colon, to give us a breakdown on how to perfectly set up your art, and get your project moving! Start with a large, high resolution photo. Resolution (Or Dots Per Inch, DPI) is a measure of detail and how clearly an image can be displayed at a certain size. CD Sleeves are 5” wide by 5” tall. A high resolution CD Sleeve image will be sized to those proportions and will look clear. For our new site, the BandsonaBudget.com team has take a lot of time and care in creating templates for the majority of the products we offer. Be sure to take advantage of these helpful tools, and download the templates! Open up the art templates, and place your artwork. Be sure to keep your text and art within the guidelines. Having the appropriate bleed on your art will make sure none of the important parts get cut off! Make sure to keep the layers in your art for easy editing, and do not flatten it to the template. Remember to save your art files as a .psd or an editable .pdf, especially if you will need our art department to make changes! Send your art our way, and get your master in the mail. In 7-10 business days, we will ship out your shiny new CDs and CDs sleeves, ready for your merch table! Have some awesome CD art you want to show us? Hashtag #BOAB and show us your stuff!